From an early age I was fortunate enough to have an excellent introduction to history and archaeology; as a child, I visited many British places of historical interest, museums and fossil beds with my parents. At this point I was bitten by a bug that would grow for many years before directing me to flintknapping. This interest was fuelled almost twenty years ago by an introduction to archaeology; starting with evening courses for GCSE and A-level, followed by membership to several archaeological associations. A new career path was chosen? After some time collecting flint tools in the field I began producing replicas of my own for museums. This was the beginning of an eight-year adventure that would not only lead me into flintknapping professionally, but also to return to education. After obtaining a degree in archaeology at the University of Wales College Newport, I was lucky enough to be accepted as a research student working on an archaeological PhD; also with the University of Wales. I then became a full time primitive technologist, a strange term and in many ways a contradiction, as prehistoric skills are anything but ‘primitive’; imagine perhaps a lifelong city worker was plunged into a survival situation with nothing but the clothes on their back, and they had to try to survive. Assuming they had managed to figure out some basic food resources and make some form of shelter, imagine then how ‘primitive’ prehistoric skills would appear to them after such an experience. 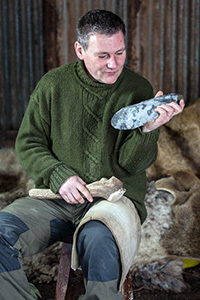 I have accumulated a great deal of experience lecturing on and demonstrating flintknapping and many other prehistoric technological skills to schools, colleges, museums and universities around Britain. I have also provided extensive teaching collections for several British universities including Bristol, Liverpool, Durham and branches of the University of Wales. I have also carried out demonstrations, and experimental research for the British Museum, London, and assisted research students in various projects over the years. I was deeply honoured to provide all of the replica stone tools for the ‘One Million years of Man’ exhibition hosted by the Natural History Museum, which was a huge success. It is my aim to continue my research into the production of prehistoric stone tools and primitive replications and to produce quality items for the education of future archaeologists at all levels and the general public. I am passionate about what I teach and about passing this knowledge on to a new generation. I also think myself incredibly lucky to be able to pursue what began as a rather ‘geeky’ hobby, as an occupation; something I hope that shines through in my demonstrations and workshops.